There’s a lot of talk these days about downtown revitalization and the future of Montgomery. The city government has pushed its chips almost entirely onto the square betting that downtown economic development will lift the rest of the city. There are plenty of people eager to talk to you about the future of downtown, and they’ve got architectural sketches and demographic surveys to back up their sales pitch. But not as many people want to talk about the past. I don’t mean the fact that there were slave markets there. And I don’t mean the type of nostalgia that drives people to want to have a street fair or a downtown soap box derby race. Yet the evil segregationist archetype is fixed in the popular mind as the villainous housewife of “The Help” or the cretinous mob of “Django Unchained” — nobody we’d ever know, or certainly ever be. But the disquieting reality is that the conflict was between not good and evil, but good and normal. The brute racism that today seems like mass social insanity was a “way of life” practiced by ordinary “good” people. But in my particular reflections on the recent history of downtown Montgomery, I’m not thinking about the ethical judgment necessitated by civil rights. I’m just thinking about how regular folks, overlooked folks, did keep businesses downtown, even though the surrounding shops were shuttered, leaving entire blocks looking like a bomb had gone off. One such merchant was John Durham. Until January 1, 2013, Durham ran a watch repair shop in the Bell Building on Montgomery Street. Today, when walking by, I noticed that his shop was empty. Mr. Durham was inside, making one last sweep of the place before closing the door behind him for good. I didn’t know he was closing. I stopped in to let him know that we’d miss seeing him in there, peering through a jeweler’s loupe into a beautiful set of meticulously arranged gears. He offered me a jug of hydrochloric acid, not knowing how tempted I was to take him up on it and cart around the dangerous liquid that he had used for some process related to gold plating. I didn’t tell him that we had briefly blogged about his shop, encouraging people to take their watches there. I didn’t tell him that, although I had never used his services (and don’t even wear a watch), that it warmed my heart to see him at work. I didn’t talk about how I was sad that cell phones had reduced watches to luxury status symbols for the rich, nor did I express admiration for the details and focus that an artisan must have to work with tiny machines that measure our lives in such discrete increments. No, instead I told him that we’d all miss him and wished him the best in his retirement. He is, after all, in his 90s and he said that he had plenty of housework to catch up on. I don’t honestly know if Durham is a nice guy or not. I never heard anything negative about him. But it’s interesting how my mind valorized Durham’s longevity, his commitment to his work, the generational and technological divide that he represented. I would love to be so passionate about my craft that I continue to work on it into my life’s ninth decade. Alvin Benn, himself an elderly icon of Montgomery, wrote an indispensable story about Durham for the Montgomery Advertiser on July 25, 2010. For the moment, it is online at this Sidney Lanier website. But if the operators of the site take it down, it’ll disappear in the impenetrable archives of the corporation that owns the Advertiser. The article is good, as most of Benn’s feature stories and profiles are. It’s the reason I didn’t try to interview Durham before. It contains plenty of info about his 65-year career fixing watches, his 70 years in Montgomery, his 40 years in the Bell Building. At the Bell Building today, I felt lucky to have run into Durham before he left for the last time. I held the door for him as he carted the hydrochloric acid to his minivan, saying that he thought some auto parts people might could use it — something about car batteries. I looked in at his empty shop, where he used to have some really cool pocket watches, and little velvet cases, and a set of intricate tools. 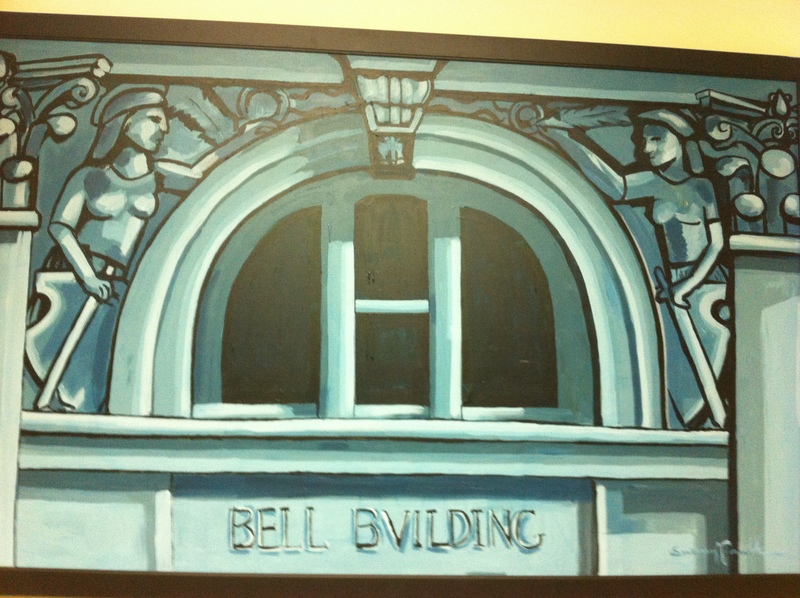 I looked at the Bell Building, which is over 100 years old and currently for sale. I thought about the old guy around the corner that runs the engraving shop, which may also be an endangered business as people just order plaques and trophies off the Internet. There’s something both sad and beautiful about the sole proprietorship run by a single person with no successor. When the person ceases to engage in commerce, the business goes away. People get old. People stop wearing watches. Durham Watch Service didn’t have a website. It didn’t have a Facebook page. It almost never advertised. But it had a loyal customer base who respected the craft of someone who was incredibly skilled. And now there’s an empty place on the ground floor of the Bell Building on Montgomery Street. Downtown Montgomery will carry on, with minor league baseball, some hotels, a ton of bars and over-priced restaurants serving mid-grade food to convention attendees and tourists looking to tweet photos of themselves standing next to something or other about civil rights or the Civil War. But hopefully, people will take a minute and look up at the Bell Building and think about how small merchants used to make things and provide services to folks. This entry was posted in Montgomery history and tagged Bell building, downtown, Durham Watch Service, John Durham. Bookmark the permalink. Nice piece. Mr Leibowitz the engraver is a wonderful man. Last year he was going through a cancer bout and his sister, who’s also great, was helping him out. Also glad to see Sunny’s painting up here. Yea, Sunny! Thank you for this wonderful article about my Dad. I am very proud of him and the reputation he has maintained. I thank all those who have commented to me over the years about their experiences with “Mr. Durham.” My brother Wendell, sister Suanne and I have worried less these past few years because so many people downtown, like yourself, have kept an eye on him. Thank you. He leaves some very big footsteps to follow. We were blessed to be raised by him and my Mother – both shining examples of goodness, charity and faith. They have been a blessing to many. Thank you again for telling his story. Wonderful article and a beautiful tribute to a great artisan and a wonderful era when people were still people. Mr. Leibowitz passed awy last week. Wishing good health and a few more god years to my Uncle John. I too want to thank you for these kind words about my dad. We are all very proud of him. I know that he is going to miss his little shop in the Bell Building. Not because of the work he performed but because of the interaction he enjoyed with people like you. As Jack mentioned in his comments, we didn’t worry too much about Dad these past few years because we knew someone was looking out for him. Thank you to everyone! He’ll now be spending his time enjoying his full retirement with our mom. They celebrate their 71st wedding anniversary in February. So you see, we do have two pair of very large footsteps to follow! Thank you, again. shop daily. Also, good to see Sunny’s painting! I would also like to see some mention of Mr. Pitt’s the tailor up on the thied floor I think. He had a few stories to tell also. The Bell building is a real Icon and I hope that it and it’s history gains inroads in our cities history. News is the Bell Building is sold, now to become a hotel. Mr Durham was a walking wealth of information. I truly regret not having enough time to understand all that he tried to tell us.